Recently we were delighted to be contacted by Roy Beattie, great grandson of Alfred Romary biscuit baker to Royalty. In his family tree Roy found that grandmother Annie was the eldest of Alfred’s nine children, who lived opposite the bakery. His parents worked at Romary’s factory in Tunbridge Wells where Roy was born. 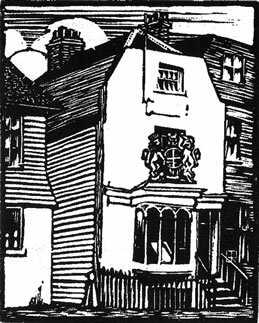 Above left is a woodcut of Romary’s when it bore Queen Victoria’s Royal Crest. If anyone comes across a photo of this do let us know. In the centre Alfred welcomes Queen Victoria to his store on the ceramic. The building, right, is as it looked on Chris and Marilyn’s visit in 2007. This was the first model they researched in situ before launching the site in 2008. Roy chanced on our site while searching for a recipe of Romary’s famous Tunbridge Wells Wafer (as shown from bakingforbritain) a favourite of Victoria and our present Queen. By concidence, he lives not far from us and also plans to re-visit his birth town soon. 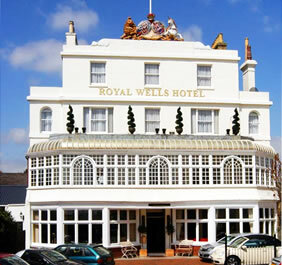 Above is the Royal Wells Hotel where Queen Victoria stayed, especially as a princess. The Tunbridge Wells Museum has a small Romary’s collection on permanent display. However if you make an appointment someone will show you all the stored items too, including letters from Royalty and information on the old production process. Like us, Roy is planning to do this and may even discover old pictures of his family. It isn’t everyday that you come across your great grandfather welcoming Queen Victoria to his store on a ceramic! So Roy bought our second-to-last Queen’s Biscuits piece. It was a pleasure to send this to someone with such a strong family connection to the building and its history. We hope it will be a treasured heirloom for generations to come! Note: The Queen’s Biscuit Maker is sold out. The Chocolate Shop on the same building is still available on our site. Its feature page has information on Romary’s Bakery and Queen Victoria. 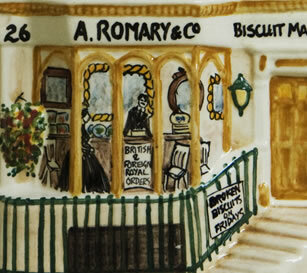 When I started researching my family tree last year I was aware of my connection with Romary’s, as I already had a booklet “Tunbridge Wells Biscuits – The Story of Romary’s”, which was compiled by a friend of the family in the 1980’s. I remember my grandmother with great affection, but my grandfather, George Frederick Marsh, who took over the business in 1910, died before I was born. 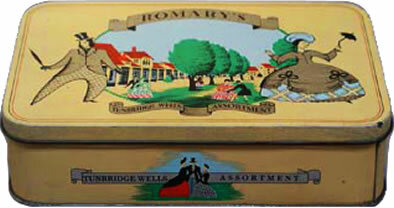 Romary’s was bought by Rowntrees in 1935 and the business in Church Road, Tunbridge Wells closed in 1957. I was very surprised to come across “A Piece of Britain” web page, as previously I had been looking at another page on the history notes for Tunbridge Wells Wafers, which was not entirely correct. I was therefore very pleased to be able to purchase a lasting memory of Romary’s in ceramics. My wife and I are having a few days in Tunbridge Wells next month, so will be able to see the shop again, and visit the local museum. Many thanks for your comments. 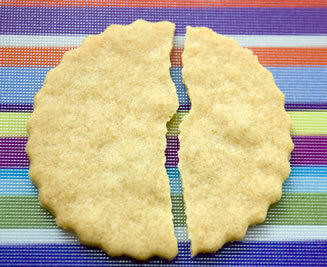 I do find it interesting that people are trying to replicate the Wafer recipe. As the Baking for Britain site suggests, the original should be lodged in Nestle’s archive after they acquired Rowntrees, owners of Romary’s since 1935, in 1988. Although unsuitable for modern production methods, the wafers continued to be made at Rowntrees in Glasgow from 1963-1981 “because the Queen liked them”. 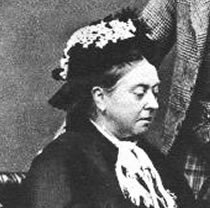 What really intrigues me is the date of Queen Victoria’s visit on 23 December (1876). After husband Albert’s death in 1861 she wanted to keep as many family traditions as possible. They always celebrated Christmas Day at Osborne House on the Isle of Wight on 24 December, as is the European custom, in deference to Albert’s German roots. (To this day our Royal Family still open their presents then.) So on the 23rd Victoria must have been on her way to the South Coast, presumably by train, where a boat was waiting. My theory is that she was stocking up on free Romary samples for the Christmas holidays! We wish you a lovely break in Tunbridge Wells. June should be the best time to visit The Pantiles area, with the hanging baskets in flower. We would love to hear how you get on and whether you make any new discoveries in the museum. Sorry its been a while since our trip to Tunbridge Wells in June. Although the weather was not great my wife and I found it a very interesting visit, particularly to the museum. We were able to take a few photos through the glass cabinet displaying the Romary memorabilla, especially the letters ordering the Wafers, and the tins. We also met one of the staff who was very interested, and suggested that I contact Nestle’s to see what they have in their archive. However, we didn’t make any new discoveries or see any old photos. We then went on to visit the old shop in Church Road, and took some photos of the shop front and the plaque. 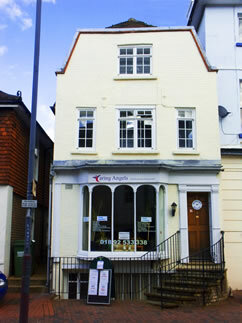 As I started my first job in Lloyds Bank in Tunbridge Wells, I took a photo of the old building and one of the former sub-branch opposite the Pantiles where I also worked, which is now an estate agent. The Pantiles looked much the same and the hanging baskets were great. We also went to see where I used to live with my parents, which again hasn’t changed that much. We left that house in 1962, to move to Sussex. My wife and I also visited Hever Castle and Penshurst Place whilst we were in the area. If I obtain any further information from Nestle’s, I will let you know. I have just started researching family tree and found different web sites that I have found useful. A couple weeks ago, I found the biscuit site. I knew Romary’s and Middlebushers had a wine factory years ago, because I’d seen the bottle at a distant cousin’s – Middlebusher’s with the Romary name. Yes I’m a Romary by the way of my Romary side. My great grandfather was Arthur Ingles Romary. My grandfather was Arthur Harrison Romary. I have found my 6th great grandfather: William Romary, born 1793 at Penshurst, Kent, England and his wife Sarah Wickenden, 1789-1866. My 8th great grandfather was William Turk. Elizabeth: Mexico, Oswego, New York, USA. Would love to hear from distant relations. Thanks. Just seen your posts. I have a pretty well documented family History of the Romary Family. My great Maternal Great Grandfather was Alfred Romary. I have managed to find some interesting information from the Nestle archive. Sadly – nothing about the production process. I wonder if any of you have been to the Museum in Tunbridge Wells to see if they have any information? Do you have the booklet produced by the museum called The Story of Romary’s? This has something on production. It costs £1.25 plus postage. I rang the museum on Wednesday and spoke to Jamie Taylor. You can order it from jamie.taylor@tunbridgewells.gov.uk. In the meantime we would love to hear your interesting information from the Nestle archive! I looked into the Romary archive some years ago now . We were about to have our Reunion in Royal Tunbridge Wells so it was a good stimulus. Yes – I did make an appointment to view the archive. It was really interesting to see so much information. That’s the good news. The bad news is that much of the really old records are not there. What I found were Minute books and artefacts that followed the progress of Romary through to Rowntree and its eventual demise having sold all its premises in TW after moving equipment and production. It seems the demise was really prompted by the restrictions during the wars and then into the 50’s on the very essence of Romary’s production – butter and sugar. 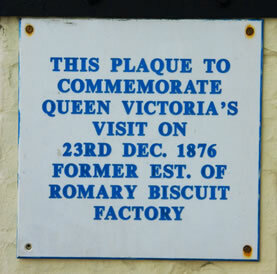 Alternative products were devised but of course – by then – mass production of biscuits was necessary to maintain quality, output and lower costs that Romary in TW could not match. So – it is a lovely memory! My mother never had the recipes sadly – but she could remember talk of the baking and some of the Lino cuts that appear in adverts for Romary’s do show the paddle bringing biscuits from an oven. This highlights the very labour intensive baking process that was used. I have seen your comments about Tunbridge Wells. I would love to have any thing about “Romary” history. I’ve been working on my family descendants, but I’ve found so much connections by marriage that in some cases I’ve found about 15-18 great great grandparents. One of them was Stephen Romary. I know that he was born in Heathfield Sussex England, died 1845 in Southborough Kent England. He married I believe Mary Watkins. Also I know that the Romary family also had a winery in England. A distant cousin, Middlebushers had a bottle on their kitchen counter that I saw one day long ago. Was wondering if there was any information about this. I haven’t seen any yet. I was very interested to see the comments from Drummond Romary Forbes, concerning the information he found from the Nestle archive. I too found some interesting information from the Romary archive held in Rowntrees collection by The Borthwick Institute in York. Would it be possible to make contact with Drummond through your website, to enable us to swap information on the Romary family?. We are forwarding your email addresses to Drummond who will hopefully be in touch. I know my Aunt (Sharon Middlebusher Ethridge) has some info on the Middlebusher-Romary connection….if you still want some, let me know and i will give you her info.